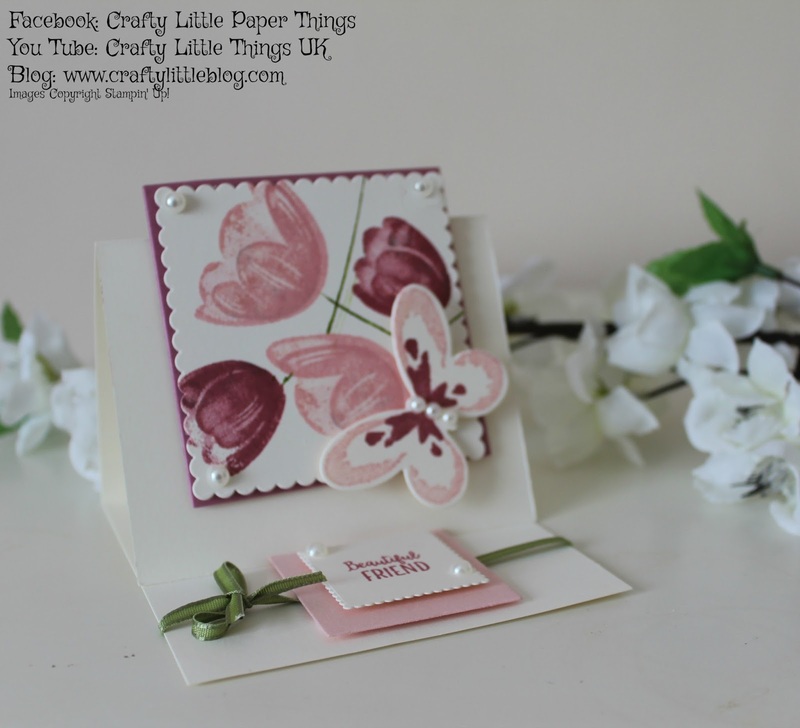 It seems to have been quite a butterfly frenzy over here in the Crafty Little Things world lately. First of all I took part in a challenge to create a Spring themed card over at Joy of Sets and for that I used some cute tulip stamps and made an easel card in soft pinks, vanilla and a touch of olive green with a pretty stamped and die cut butterfly with three tiny pearls along its body. This was so easy to make and really just involves adding a few squares to a piece of 10 x 3.75 inch cardstock which is scored and folded on the long side at 4 and 7 inches. I used mainly scrap pieces for this and some Sweet Sugarplum and Flirty Flamingo inks. 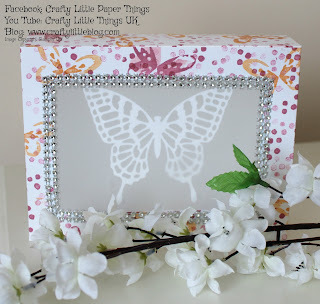 I also made this prototype light box which features lots of stamping from the Watercolour Wings Stamp Set by Stampin' Up!, using a three dot stamp and butterfly 2 step stamps again using Sweet Sugarplum but this time adding in some Peekaboo Peach for a bit of contrast and interest. This stamping is all done onto white cardstock and then the box created using two pieces measuring 12 x 10 inches and 12 x 8 inches. The latter has a 4 x 6 aperature cut out which is backed with vellum. A large butterfly cut from white card using the Butterflies Thinlets set from Stampin' Up! is added to the inside of the box along with battery operated tea lights. It looks hugely impressive especially with the rhinestone trim added around the aperature which is easy to pick up online and easy to glue on, much easier than using individual stones. The wow factor belies the simplicity of making it. My videos for both projects are make it up as you go along style so make things look a little more complex as they actually are as I go through the decision making process on camera rather than presenting a polished practiced project. Hope you enjoy having a go at these please do tag #craftylittlethingsuk if you do share photos of anything using my inspiration on Instagram or Twitter. I do love to see how creators interpret and improve on a concept or idea.